Apple2, Manuals, PDFs, by Michael. You never quite know what you will find when you go browsing on eBay. 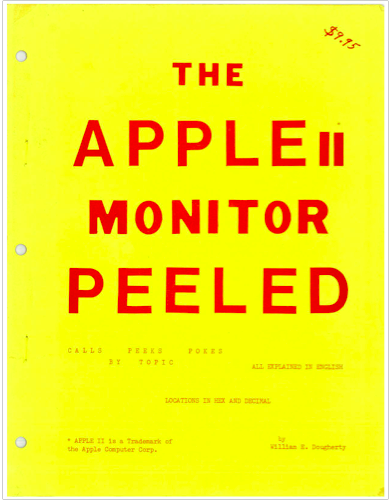 A couple of weeks ago I came across “The Apple II Monitor Peeled” and the old style presentation of it intrigued me, so I put a bid on it, and won it for pretty much the hand written price in the corner of the front cover. Its ye olde charm, and printed on 3-hole paper with a two staples binding, it was too much to resist and just had to add it to my bookshelf. A typewriter composed book written in 1979 (2nd printing) by William E. Dougherty, and perhaps his forward to the book would be the best description. While writing programs for my APPLE II, I have many times had to stop constructive work to delve into the Monitor to determine (or redetermine) how to make use of a particular function or feature. 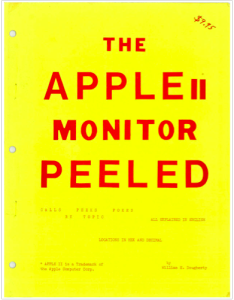 Being totally unsuccessful in finding a single PEEK, POKE, CALL reference publication in the marketplace, and having delved deeply into a dozen computers in the last twenty years, I decided to put together for myself, and maybe for others, a description of the ROM contents of the APPLE II in an organization by subject instead of organization by machine address. With a lot of encouragement from my associates who have APPLEs, I decided to go beyond the organized notes I needed for my purposes and actually finish it for publication, describing functions and features for readers to whom it would be new information instead of just making up charts of addresses with a few cryptic comments to refresh my memory. Although the listed CALL points in the Monitor are most useful to the machine language programmer, very many are also useful to BASIC or APPLESOFT programmers as well. For example, keyboard input of single strings which happen to contain commas and cassette tape input and output can be accomplished by the methods described within. While programming in Integer BASIC you may have decided that arrays of two dimensions would be a way to keep dollars and cents separate to allow quantities larger than $327.67 to be manipulated, and then decided otherwise when faced with a multiply. This publication is the first in which I have seen documentation for the use of the 16 bit/32 bit multiply and divide routines in the (non-auto-boot) Monitor.